This week, silversmith and designer Brigitte Huet is coming to visit and I’m really excited! Brigitte’s work is extraordinary. 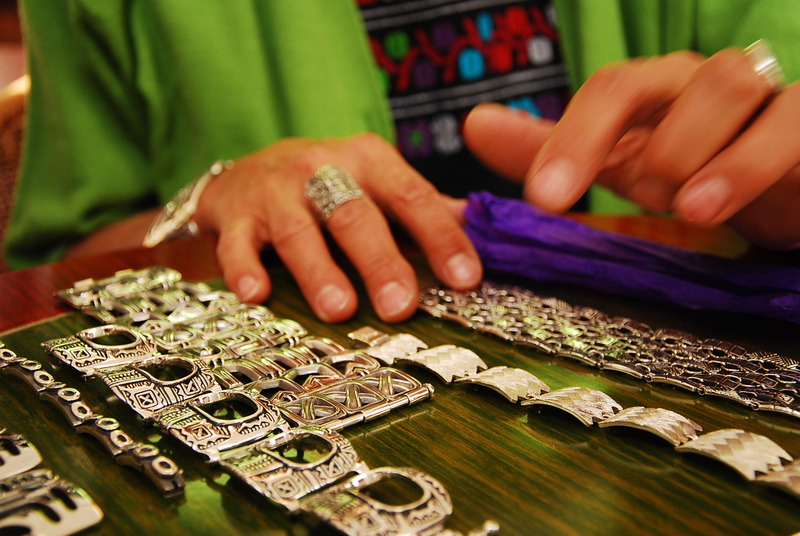 She uses the lost wax technique to create deeply carved, high-relief silver jewelry that is derived from pre-Hispanic — Aztec, Mayan and Zapotec — symbols. Her work reminds me of sculpture. See the show schedule below. Friday, April 29, 5-8 p.m., show at Davenport & Winkleperry Gallery, 18 Salisbury St., downtown Pittsboro. Brigitte asked if we would host her in North Carolina because tourism has dropped off in Oaxaca related to fear of drug violence (There is no indication of this that I can see in Oaxaca. Many of you who know Mexico understand that the drug wars are localized at the border states.) Artists and artisans in the state that depends heavily on visitors for their livelihoods are suffering. When I explained this to friends, they stepped up to co-host Brigitte’s visit. Co-hosts at Erica’s house are Hollie Taylor Novak, Helen Snow, and Helen Spielman, all of Chapel Hill. Co-hosts in Pittsboro are Cindy Edwards, Helen Mikul, Julia Kennedy, and Molly Matlock. If you live in the area, please come! This entry was posted in Oaxaca Mexico art and culture, Travel & Tourism and tagged art, culture, Mexico, Oaxaca, postaweek2011, silver jewelry, traditions. Bookmark the permalink.